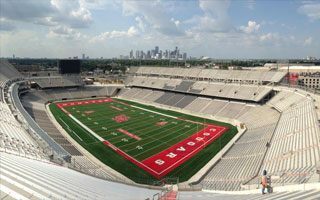 In early 2010 the University of Houston commissioned a feasibility study into potential redevelopment of Robertson Stadium. By June it was clear the structure would be destroyed completely. New one would replace it, but also be rotated by roughly 90 degrees to ensure a great view of Houston’s skyline for many fans sitting along the south side. A peak is available below. Construction was launched in December 2012, but formal groundbreaking ceremony was held in February 2013. The simple steel prefab skeleton was initially thought to cost $120 million, but the budget was reduced ahead of construction to $105 million. Though last minute works are still ongoing, the new stadium was opened without major glitches last Friday, August 29. From that day on it’s the home of Cougars, UH football team. Before opening the first naming rights partner was found, local financial giant TDECU. The company agreed to pay $15 million for a decade of naming rights. The stadium was designed with 40,000 people in mind, most of them on benches. But, should demand grow, it’s already prepared to get extra 20,000 capacity without major interference with current structures. There are 26 large suites, 42 smaller skyboxes and 766 corporate seats.